This webinar assists with creating critical-thinking test items for all of your exams. You’ll obtain valuable student response data from these new questions that can guide future editing, and help you obtain the greatest benefit from your authoring efforts. 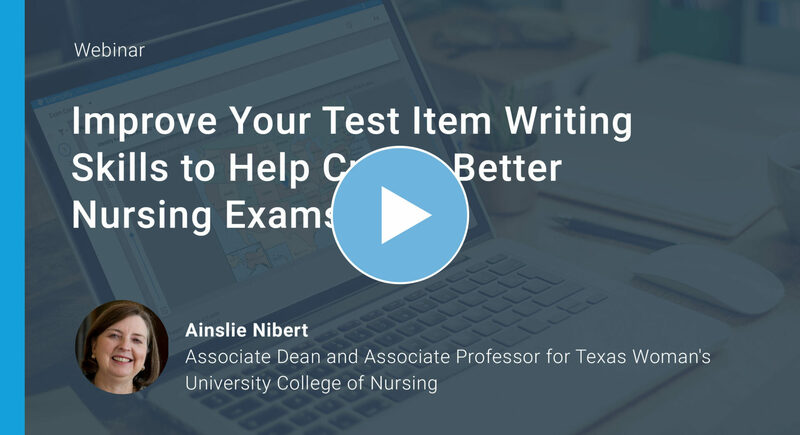 By performing a systematic item analysis after each exam, you can pinpoint students’ knowledge gaps, which will help you focus your item writing on those course objectives that are globally misunderstood or ignored. In addition to reviewing item writing techniques, we’ll also cover the advantages of using electronic test blueprints to establish test validity and tie your assessments to your overall program objectives. Critical thinking test items contain rationales, are written at the application level or above, require multi-logical thinking to answer, and ask for high levels of discrimination. Using a test blueprint as your create an assessment is essential to ensure that items reflect your intended objectives. An effective 3-step method for item analysis includes review of difficulty level, discrimination data (Item Discrimination Ratio and Point Biserial Correlation Coefficient), and effectiveness of alternatives (response frequencies). Ainslie Nibert is a nationally-recognized expert in nursing curriculum, testing and measurement. She currently serves as Associate Dean/Associate Professor, Texas Woman’s University College of Nursing – Houston, and as a corporate consultant to nursing academic and clinical practice organizations. She previously served as Senior Vice President and General Manager for Review and Testing/HESI, at Elsevier, Inc. Dr. Nibert is a Fellow in the American Academy of Nursing. She is a member of Sigma Theta Tau International Honor Society of Nursing, where she is a Virginia Henderson Fellow and was a Faculty Advisor for the Nurse Faculty Leadership Academy.